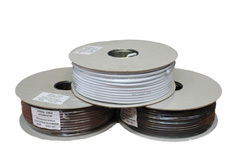 RG6 is a commonly used coaxial cable for home use, and is generally used for TV transmission in the UK. CT/CTF100 - this range of television and video cable is used primarily to carry TV, Satalite and CCTV signals. This range of television and video cable is used primarily to carry TV, Satalite and CCTV signals. It is suitable for external and duct grade applications. This range of television and video cable is used primarily to carry TV, Satalite and CCTV signals. It is suitable for direct burial applications.